Researchers at Essex University have played a key role in a landmark project that has seen a person with an amputated hand become the first recipient of a prosthetic hand that provides tactile sensations and greater levels of dexterity. In a pioneering surgical procedure carried out Sahlgrenska University Hospital in Gothenburg, Sweden, titanium implants were placed in the patients two forearm bones, from which electrodes to nerves and muscle were extended to extract signals to control a robotic hand and to provide tactile sensations. The team claims that this makes it the first clinically viable, dexterous and sentient prosthetic hand usable in real life. The new implant technology was developed in Sweden by a team led by Dr Max Ortiz Catalan at bone-anchored prosthetics specialist Integrum AB and Chalmers University of Technology. This surgery took place as part of a larger EU funded project called DeTOP, which is led by Scuola Superiore Sant’Anna, and also includes Essex University, Prensilia, the University of Gothenburg, Lund University, the Swiss Center for Electronics and Microtechnology, INAIL Prosthetic Center, Universitá Campus Bio-Medico di Roma, and the Instituto Ortopedico Rizzoli. Conventional prosthetic hands rely on electrodes placed over the skin to extract control signals from the underlying stump muscles. These superficial electrodes deliver limited and unreliable signals that only allow control of a couple of movements (opening and closing the hand). The new device delivers richer and more reliable information by implanting electrodes in all remaining muscle in the stump instead. In this particular case sixteen electrodes were implanted in the patient. Current prosthetic hands have also limited sensory feedback. They do not provide tactile or kinesthetic sensation, so the user can only rely on vision while using the prosthesis. Another advantage the new technology has over current prosthetic hands is that by implanting electrodes in the nerves that used to be connected to the lost biological sensors of the hand, it’s possible to deliver sensations from the sensors of the prosthetic hand to the patient. 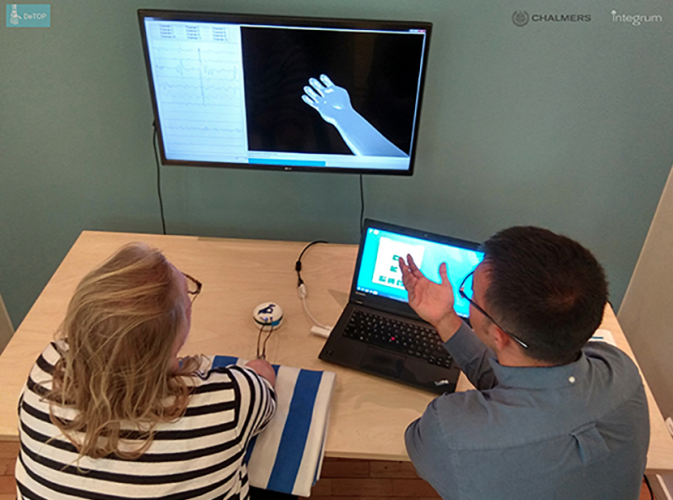 The current patient is now following a rehabilitation program to be able to fully load the prosthetic hand, whilst two more patients (in Italy and Sweden) will be implanted with the technology in the coming months.